If you are ready to buy, click this link here. the opportunity to try this with NO RISK! This is your chance to ADD or INCREASE superfood to your daily nutrition. Individual results vary, but in the past some people have experienced increased energy, better digestion health, and easier fat loss when this is done with both a workout & additional food intake changes. We are talking just 3 weeks. That's not too long. You have the chance to increase health, possibly change habits, and an opportunity to experience change in health. 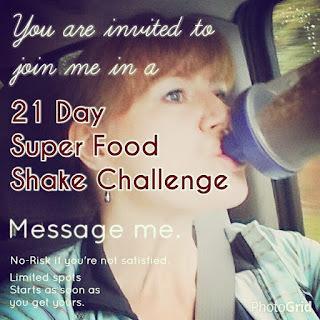 You will be required to purchase this superfood and drink 1 a day for 21 days, but if after 21 days you are not satisfied with any results, you may be refunded the price of the product. I am here to help you reach your health goals. After speaking to many of you this past week, I felt it was necessary to offer this challenge. Especially when you can be refunded if you're not satisfied. The good news is, if you ARE enjoying the increased nutrition daily, I have many options for you in getting this product for a discount and for some, possibly getting it FREE monthly. I would like to keep the challenge group small so it is intimate and personal. Or if you want to request, I can just keep it an individual challenge with you privately. Please let me know your preference, group or individual. Your purchase will support missions in Guatemala to help build homes for the homeless or living on dirt floors. Please message me and inquire about details.